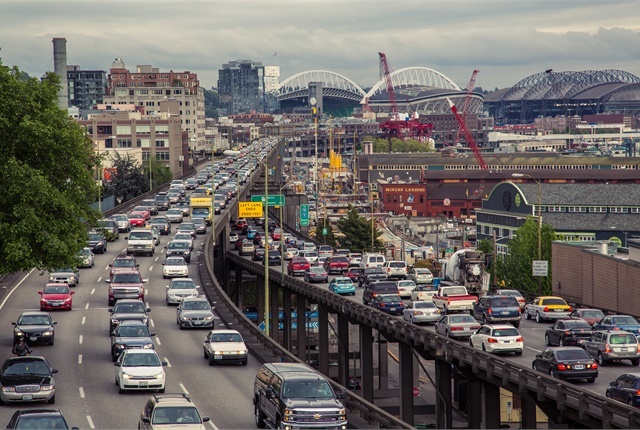 Photo of Seattle traffic jam by Tony Webster (from Portland, Ore.) via Wikimedia Commons. In the first half of 2016, an estimated 17,775 people died in U.S. traffic crashes, according to projections from the National Highway Traffic Safety Administration (NHTSA). That figure represents about a 10.4% increase from the same six-month period in 2015. The second quarter of this year was the seventh straight quarter with fatality increases when compared to the corresponding quarters in the previous years, NHTSA noted in a report summarizing the statistics. The higher death count in part reflects increases in the amount of time Americans are spending on the road. Preliminary data, reported to the Federal Highway Administration, indicate that vehicle miles traveled in the first six months of 2016 rose by 50.5 billion miles — about a 3.3% jump. But the fatality rate for the first half of 2016 also climbed to 1.12 deaths per 100 million vehicle miles traveled — up from 1.05 deaths per 100 million vehicle miles traveled in the first half of 2015. NHTSA stressed that these statistics are preliminary and the counts for both 2015 and 2016 may be further revised next year. For now, the agency is holding off on drawing concrete conclusions about what’s specifically to blame for the 2016 increase. Last year's overall 7.2% jump in road fatalities was largely driven by increases in pedestrian, motorcyclist, and bicyclist deaths. Almost half of passenger vehicle occupants killed weren't wearing seat belts. Also in 2015, nearly one in three fatalities involved drunk driving or speeding. One in 10 deaths involved distraction.